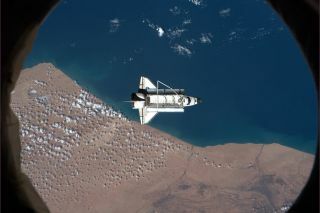 Space shuttle Discovery floats over southern Morocco during the ISS fly-around before departing to return to Earth. Everything looks good for the final landing of the space shuttle Discovery tomorrow (March 9), NASA officials say. Discovery is scheduled to land at Florida's Kennedy Space Center Wednesday at 11:57 a.m. EST (1657 GMT), bringing an end to its 13-day STS-133 mission — and to the workhorse orbiter's days in space. Discovery will end its spaceflying career with tomorrow's landing. If all goes as planned, the shuttle program as a whole will be retired later this year. Ceccacci said a final inspection of Discovery's heat shield (performed yesterday by the shuttle crew) has found no concerns for the upcoming landing. NASA has two chances to land Discovery in Florida tomorrow, and the weather is expected to cooperate. If Discovery misses the first opportunity, the second window opens up at 1:34 p.m. EST (1834 GMT), NASA officials said. After that, the next chances to land would come on Thursday. If foul weather or other problems do delay the landing to Thursday, a backup runway could come into play. Kennedy will remain the number one option, mission managers said, but Discovery could also be shunted out to California's Edwards Air Force Base. Another backup runway is also available at White Sands Space Harbor in New Mexico, should it be needed, they added. But forecasts call for good conditions in Florida, so chances of a touchdown at Kennedy are good, officials said. As Discovery prepares to return to Earth for good, mission managers praised the orbiter and her crew for a great mission so far. "We couldn't be more pleased," said LeRoy Cain, NASA's mission management team chairman. "The team just did an outstanding job. The entire space shuttle system just performed outstanding on this entire mission." While a major milestone remains — getting Discovery and her crew down safely — Cain added that the STS-133 mission has been special, and not just because it's the orbiter's last. "I would be hard-pressed to find a mission of any one of the orbiters that has been cleaner," he said. That's especially remarkable given the mission's inauspicious beginning. Cracks in the shuttle's huge external fuel tank and other problems caused major delays, pushing the launch back from November to late February. Discovery has launched 39 times — visiting the International Space Station on 13 of those missions — and carried 246 people into space, NASA officials said. NASA has two more shuttle missions planned – Endeavour's STS-134 flight in April, and the program's swan song, Atlantis' STS-135 flight in June.